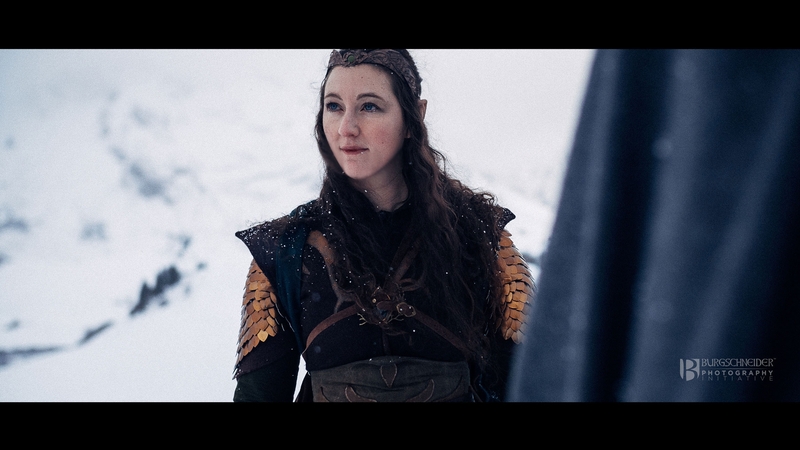 Elves have always been intriguing characters in all kinds of fantasy stories, so it is not surprising to see them being portrayed time and again. 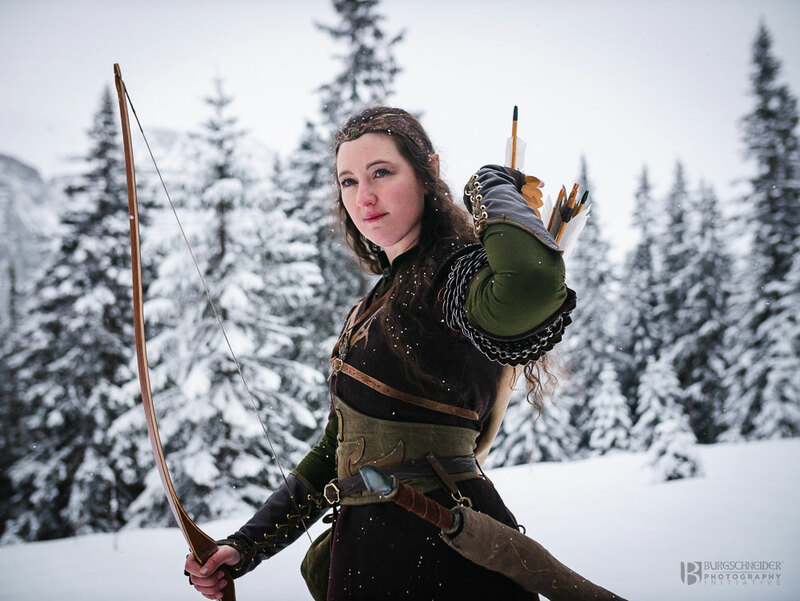 For this project, Judith Bergler set out to create a compelling costume for a wood elf warrior, using a set of tunics by Burgschneider. 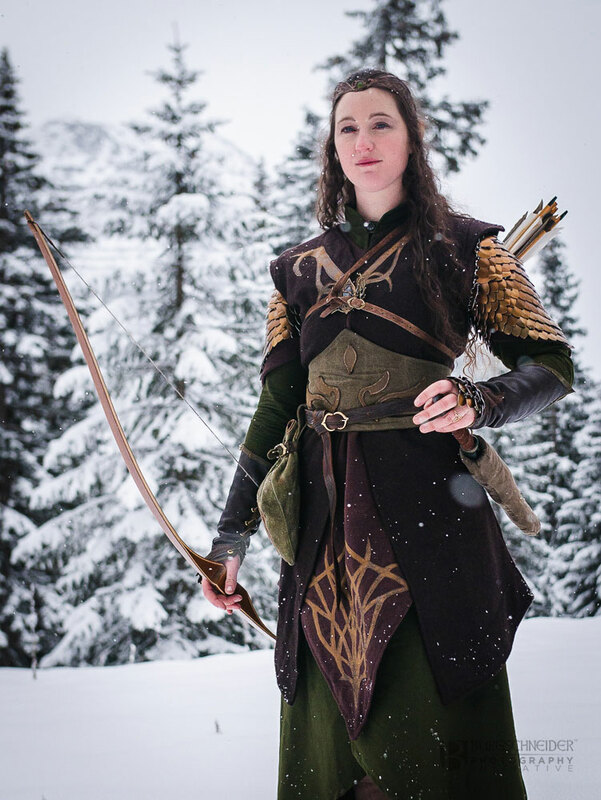 As the wardens of the deepest forest, woodelves have only rare contact with snowy mountains and icy winds - nevertheless, they need appropriate clothing for all their adventures. 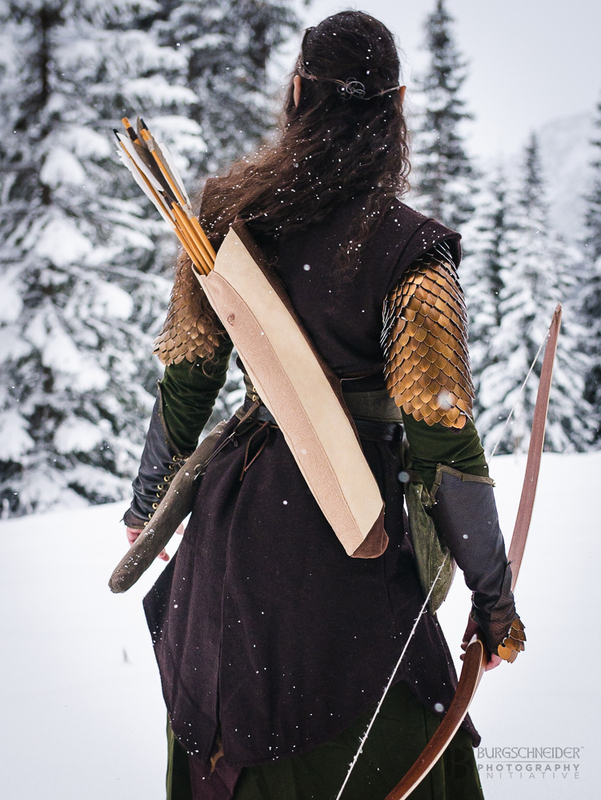 For this trip to the Alps we use undergarment “Ranwen” with long sleeves and a high collar. Although it looks like a dress Ranwen is shorter and has a front slit for improved agility while running or climbing. 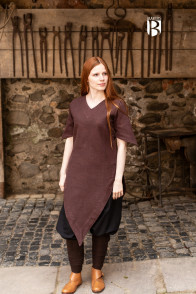 The combination of “Ranwen” with tunic “Laylin” as a middle-layer and woolen tunic “Meril” as an over tunic results in an elvish layer-look. Especially the leaf-shaped design of the sleeves and seams give the whole outfit a more nature-inspired organic look. 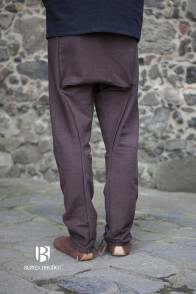 As pants we used “Thorsbergpants Ragnar” in cotton. 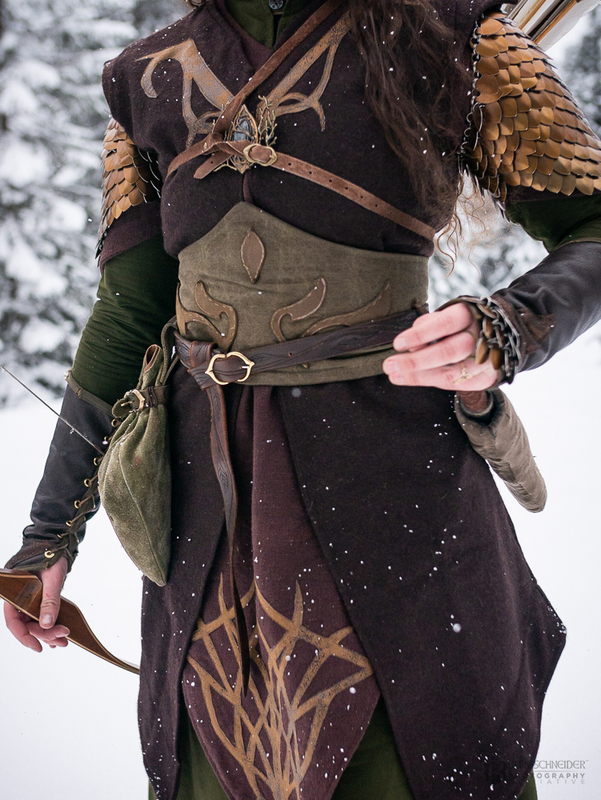 Although those pants originally are a Viking pattern, “Ragnar” offers great agility and can be easily combined with high boots. For very cold regions the woolen version “Fenris” would be a great alternative. 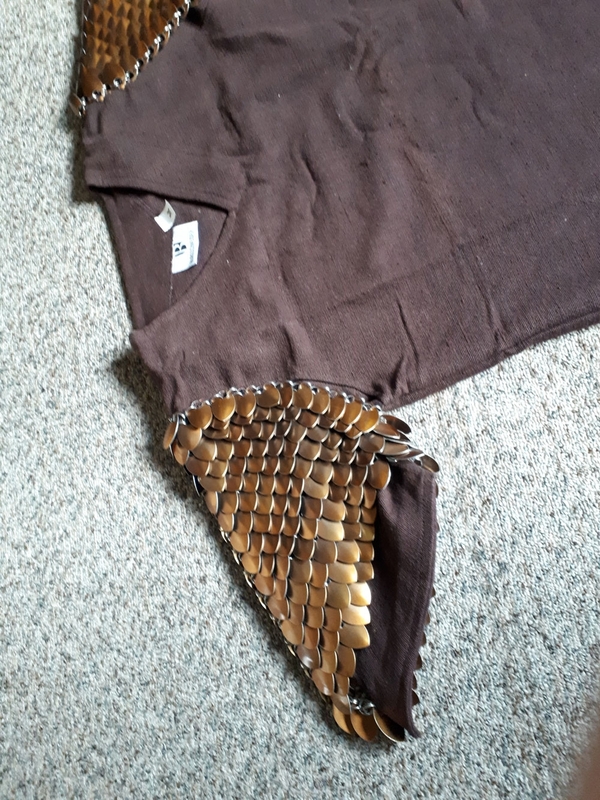 I attached scaly sleeves to the tunic Laylin in order to create the illusion of scale armor while avoiding its bulky appearance and without adding the weight of an actual suit of armor. You can buy scales for your costume HERE! 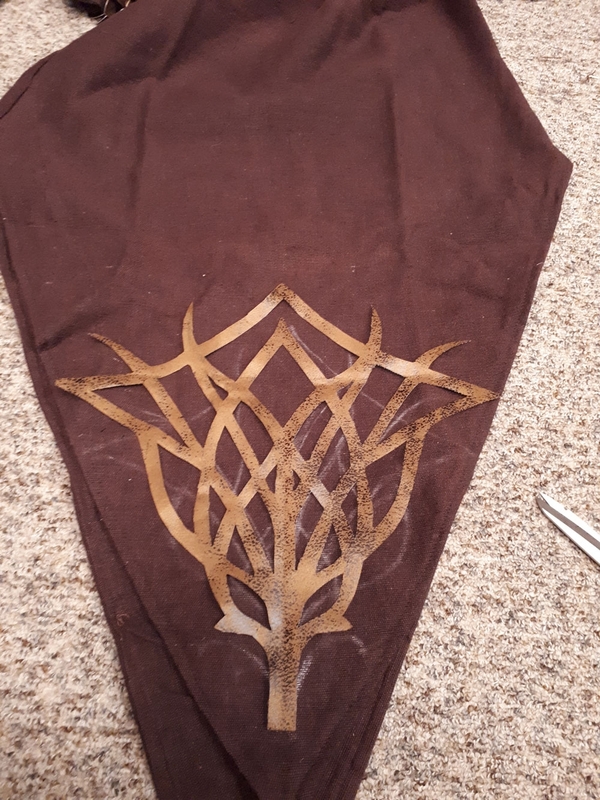 I sewed a hand-cut leatherette ornament onto the lower front of the tunic Laylin. 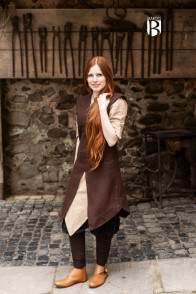 I opened the front seam of the tunic Meril so I can wear it like a coat and can dress up more easily. Let’s add more detail! Accessories such as belts and jewelry round out the outfit. The hardest part was to sketch the leather applications. Making a paper pattern, transfer it onto the leather and cut everything by hand took some time - but was worth the effort! The application was pre-fixed with fabric glue to make sewing easier. The scales have been connected by hand as well. For that you need additional metal rings and two tongs. Finally, the garment has been accessorized with art nouveau inspired jewelry that nicely fits the elven style. 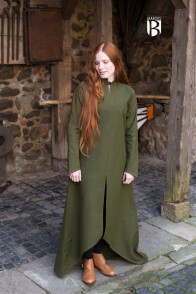 To protect the head and ears against cold wind and snow a hooded cloak or woolen coat could be added to this garment.